I don't know how I missed this. 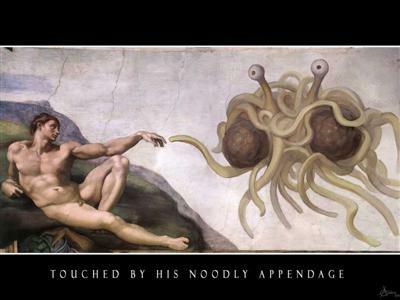 Apparently, Flying Spaghettit Monsterism (FSM) has been around since July. What's FSM you ask? FSM is an alternate theory to Evolution and Intelligent Design. Followers of FSM (Pastafarians) believe that "the universe was created by a Flying Spaghetti Monster" and that "It was He who created all that we see and all that we feel." In the beginning, the Flying Spaghetti Monster created a mountain, some trees, and a midget. The Uncyclopedia entry on FSM says it all.